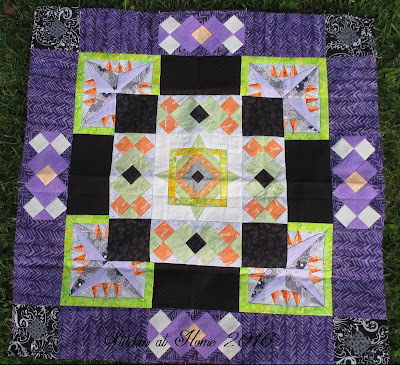 You can read about how 'Oops' came to be here, Sandra of mmmquilts first round here, Tish of Tish's Adventures in Wonderland round here and last but not least Julie of Pink Doxies round here. 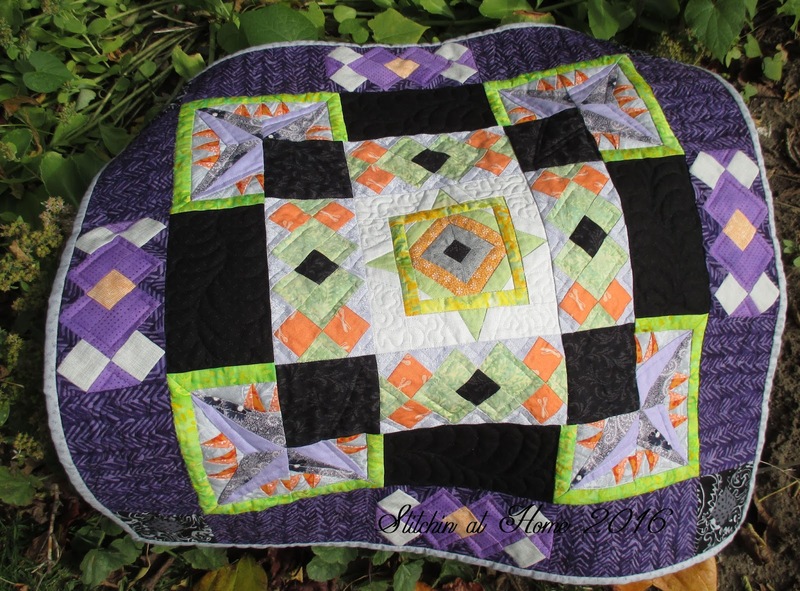 Once I sandwiched my Mini Round Robin quilt, it was full steam ahead. With no clear plan I put it under my domestic machine's foot and just started it felt so right, isn't that the way with friends. It seemed to flow as I went. In the center I echoed the star then did some meander stitching in the grey to make the star pop a little. I maybe should have used a smaller meander to make it pop more. In the seminole blocks of both Sandra's and Julie's round I again did some echoing. I also echoed the star points that Tish did extending the star into the black corners that Sandra added. 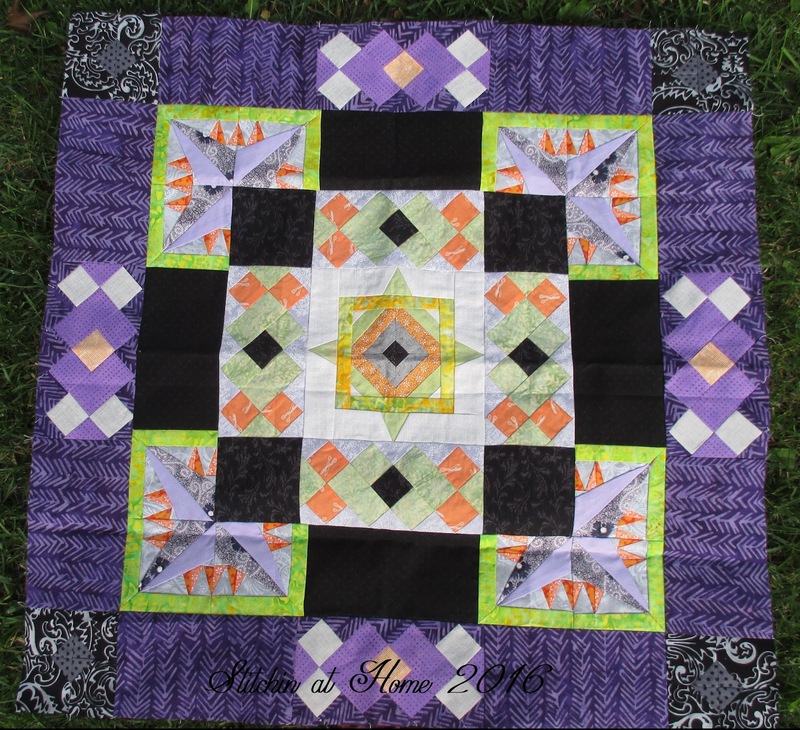 I love feathers, and quilted them in the black rectangles that Tish added in her round. 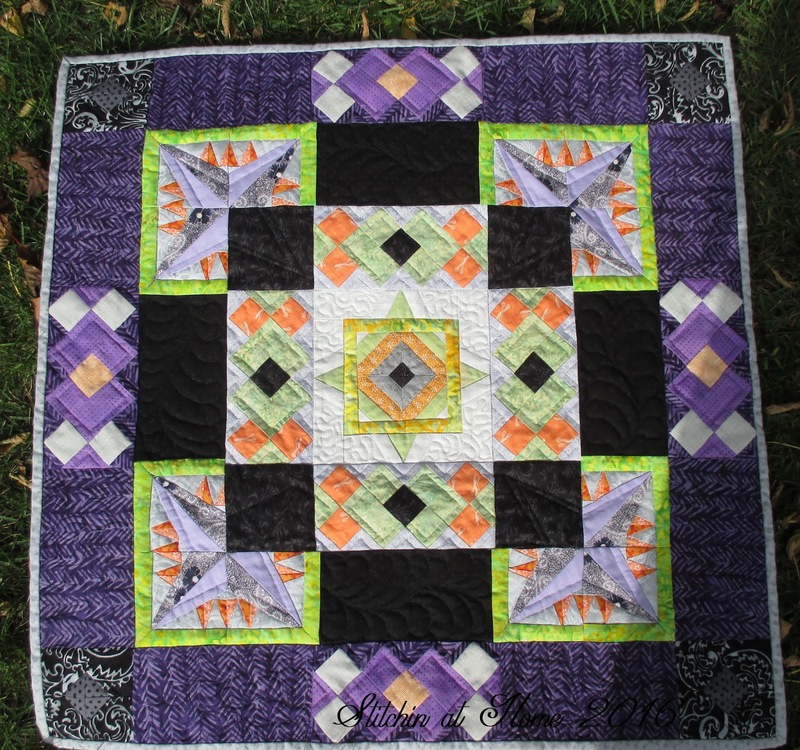 To finish it up I did some paisley's in the darker purple outer rectangles of Julie's round. The back shows the quilting much better than anything I can describe. I used two colours of Aurifil thread, black and dove for the quilting. Dove is one of my favourite colours of Aurifil thread. Every quilt needs a label, whether it is written right on the back or attached. This piece holds a very special place in my heart, it helped four friends become one. Thank you Sandra, Tish and Julie for helping 'Oops' grow up and for being the best of friends!!! You did a great job on the quilting. It's a great finish and a wonderful reminder of friends. Cindy, I love how this turned out! It's now like two minis, the pieced front mini and the back is like a whole cloth. I've enjoyed working with all of you on this project so much. Now I need to step up to the plate and get mine quilted. It's stunning, Cindy. I can imagine you were glad to check it off your list as I was. Didn't we all have fun? Also, I was surprised to see how the Aurifil was still subtle on the backing when you said you had used black and dove. 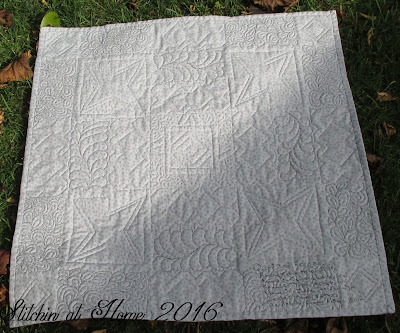 It's such a fine thread, and I think quilts beautifully. This is a nice show piece, and totally infused with our friendship. My goodness! Such a beautiful quilt - especially the way the quilting pops on the back! Congratulations on a beautiful finish! I love how this ended up. It's been fun watching these round robin quilts grow. 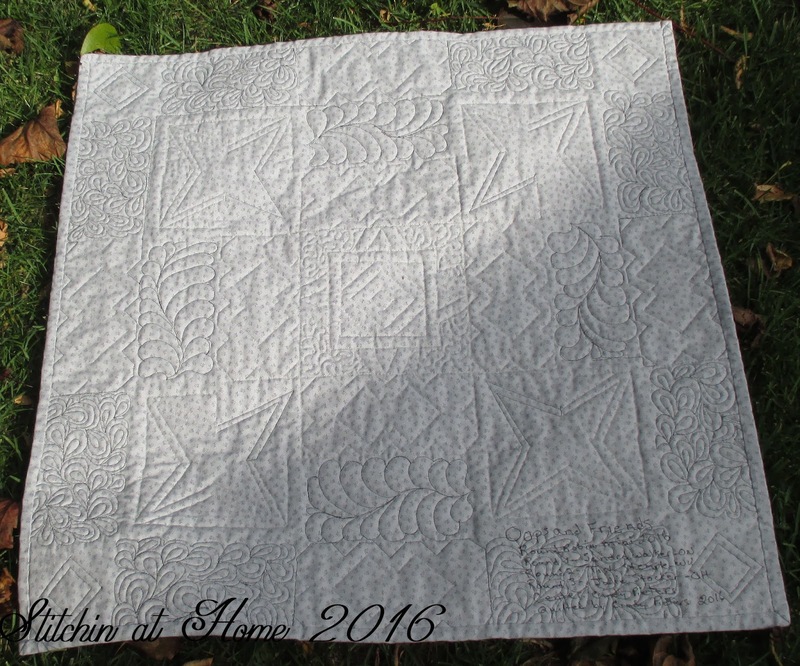 Your quilting is so pretty and really complements the design. What a wonderful celebration of a friendship! I'm loving this mini! 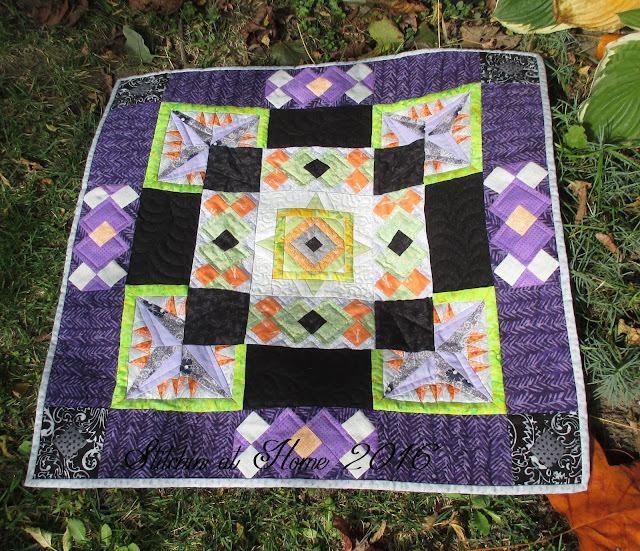 Wish you had a pattern :-) I love mini quilts!